Two star hotel with fully equipped facilities in Insadong! Saerim Hotel is a four-star hotel located in Insadong. All rooms are equipped with computer, large LCD TV and bidet. 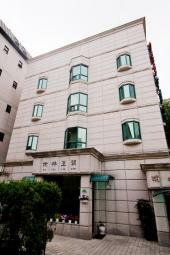 Situated in Insadong, a culture and tourists site, the hotel provides English, Japanese and other language interpretation service for tourists and business travelers. Subway line 3 Anguk staiton, Jongno 3-ga and subway line 1 Jonggak stations are all nearby, with Anguk station being the closest. Shopping along the streets of Insadong is a must-have fun. There are 31 guestrooms total with a selection of Ondol or Western type. All rooms are equipped with a computer with complimentary Internet access, water heater and cooler. Juice, water, coffee, black tea are offered along with converter and mini table.